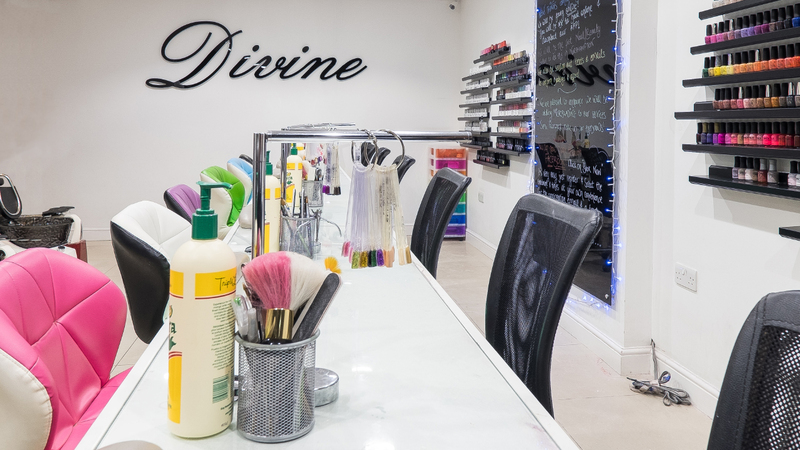 Welcome to Divine Nails & Beauty Studio. 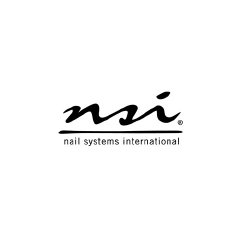 We are an independent business with over 10 years of experience in the nail & beauty industry. 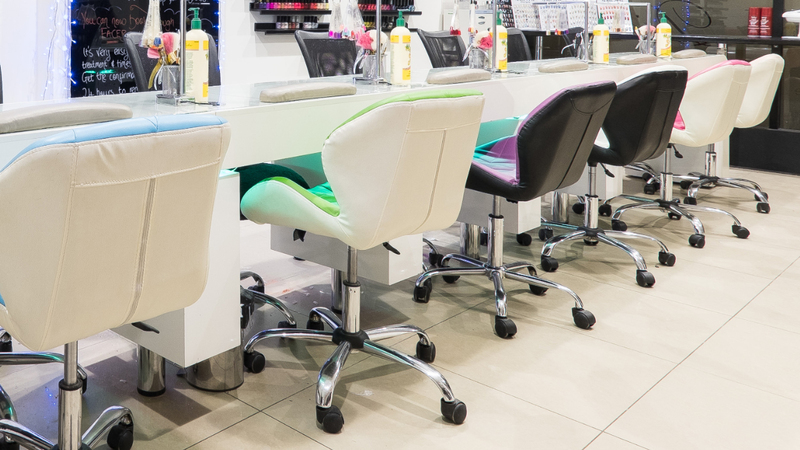 All of our staff are fully qualified and trained to the highest levels. 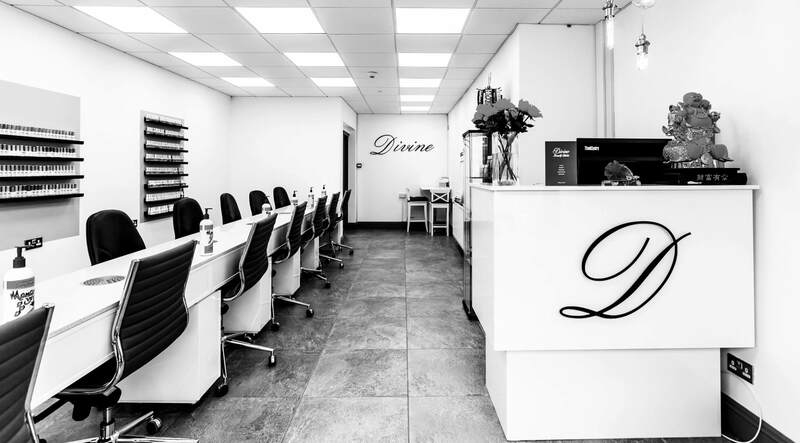 As experienced professionals, our staff will ensure you are given the best advice to leave you with complete satisfaction, whatever your treatment. 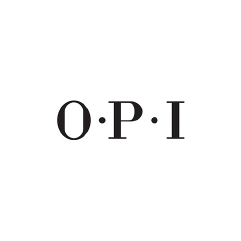 Check out our reviews to find out what our clients think of us! Includes: exfoliation, mud mask, hot towel & massage. We offer warm wax. Warm wax contains beeswax which once applied, sets to room temperature. 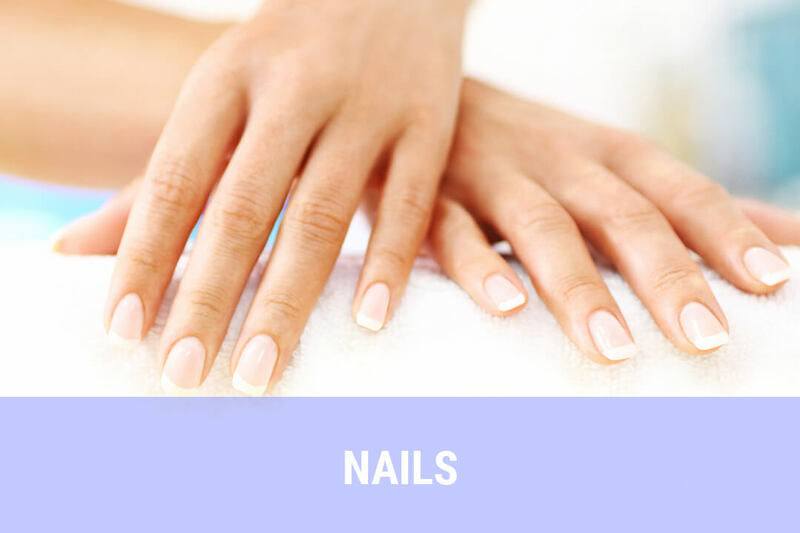 The wax is removed causing little discomfort as it adheres to the hair and the area will then remain smooth for 3-4 weeks. *Please beware of personal hygiene in intimate areas. Fake Bake gives an instant sun kissed colour and develops into a long lasting sunless fake tan, guaranteeing longer lasting (up to 50% longer), more natural-looking results. 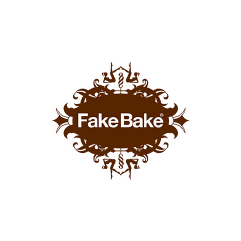 Award winning Fake Bake has become the choice of beauty experts and celebrities alike. Originated in the Middle East, threading has been practiced for centuries. By knotting the thread and creating a trap, hairs are caught and removed by the root. 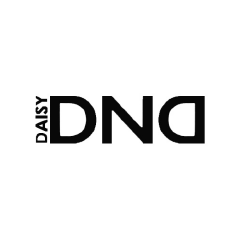 The hair is removed in an effective manner, leaving the skin clean and smooth. *Skin test required 24 hours before treatment. Crow’s feet, forehead lines, frown lines, eyebrow lift, smoker’s lines, bunny lines, gummy smile, pebbled chin, downturned smiles. 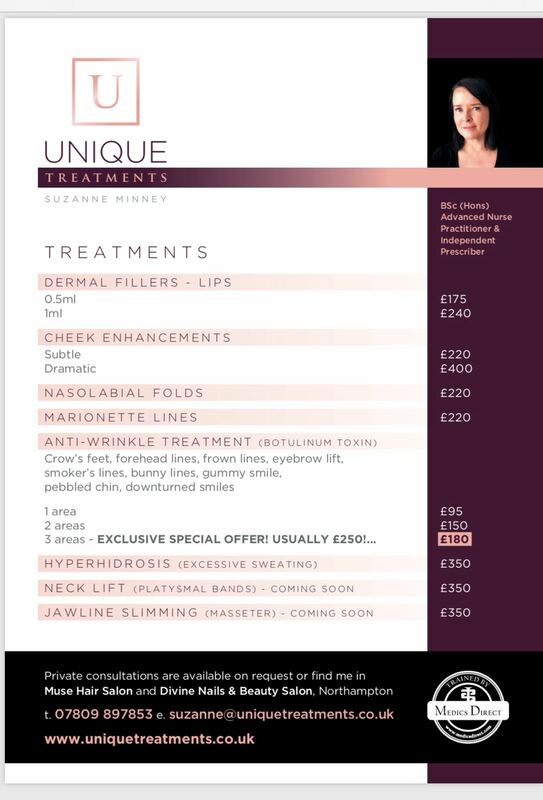 Click here to view unique treatments we offer from Suzanne Minney. Private consultations are available upon request. Available upon request, please call in for prices. 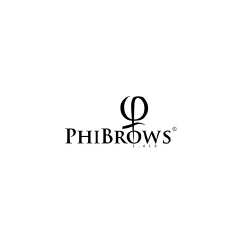 PhiBrows is a technique of semi permanent drawing of eyebrows with hyper realistic results. 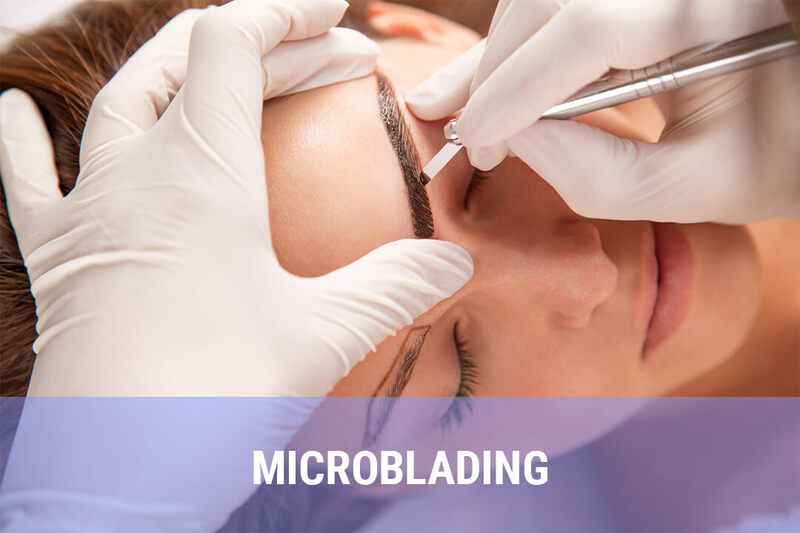 Microblading is good for people who have over plucked over the years or want more volume & shape. *Prices may differ depending on healing results. 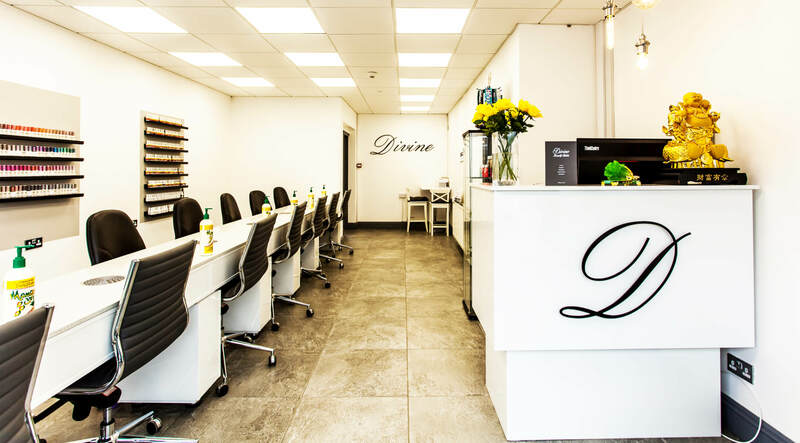 Consultation is highly recommended before booking. **All microblading appointments must be booked over the phone. 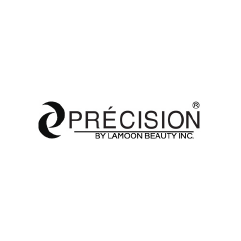 Semi permanent lash extensions are applied individually creating more length and thickness. Multiple lashes are applied to one single eyelash creating a more full look. 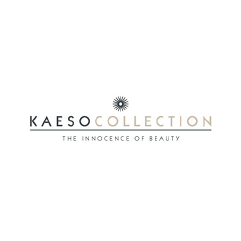 For a instant full look multiple lashes applied onto the lashes lasting 1-2 weeks. Comes in different styles and looks, an express quick make over for special one day events. Lashes can be kept and reused. Please note a patch test would be required for all lash treatments 48 hours prior to appointment. This method is great to help relieve muscle tension and pain. Heat from the stones helps ease muscle tension and pain, reduces stress and anxiety, promotes sleep and may boost immunity. Indian head massage is a relaxing holistic treatment that uses acupressure message on the head, face, neck and shoulders. It aims to rebalance your body’s energies. Deep tissue massage therapy is intense pressure movements to release muscle tension. The focus is on the deepest layers of muscle tissue, soothing all aches and tension. Aromatherapy is the uses oils to promote healing and a feeling of well-being and relaxation. The essential oils are extracted from the parts of herbs and plants and contain all the properties of the plants themselves one being grape seed and almond oil. Skin care treatments for the face, including steam, exfoliation, extraction, creams, lotions, facial masks, peels and massage. The ultimate Divine facial focusing on the removal of blackheads. The procedure includes everything from the facial therapy but incorporates a deep cleanse for the intense removal of blackheads. 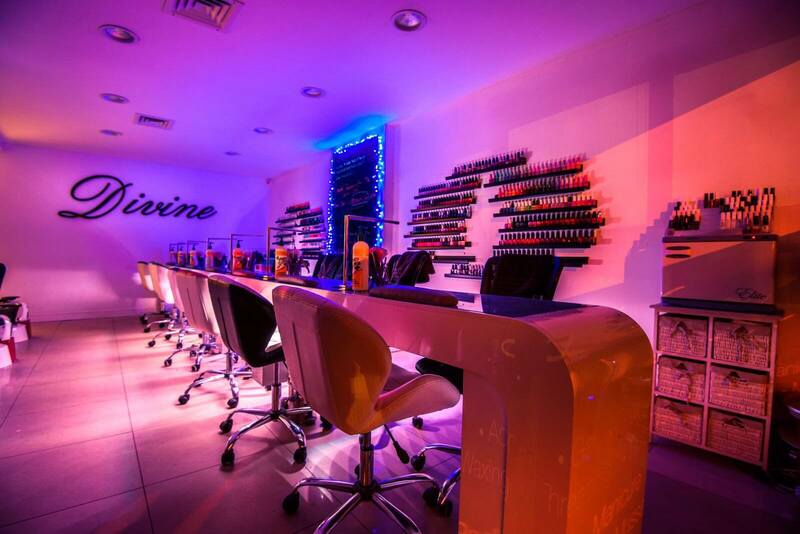 At Divine, we provide the best tanning equipment, which uses Red Light Therapy. This is a non-invasive photo rejuvenation which is safe for all skin types, promoting healthy skin and cell tissue. Unlike lasers, red light does not harm the skin and is beneficial to the fight against ageing. *All users must be over 18 and have sign records. These new tubes promote well being and great for skin problems such as eczema and gives you maximum tanning. These new tubes promote anti wrinkle and vitamin D also gives maximum tanning. We are closed on all bank holidays except for Good Friday & Easter Sunday.